We cut into the first loaf so soon after taking it out of the oven that the slices curved in on themselves a bit, not yet used to the outside world. We wouldn’t really get a good, perfect crumb until we cut open the second loaf, which had the proper amount of time to cool. 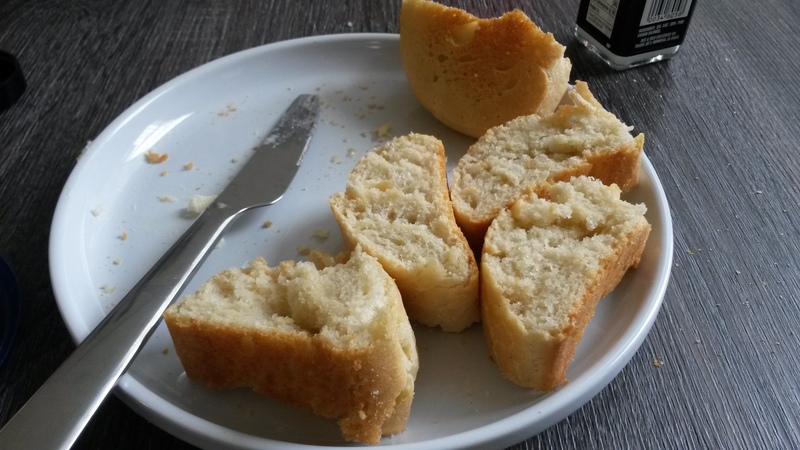 But that first loaf, eaten hot out of the oven, was perfection anyway. Between us we ate most of a loaf, one slice after another. 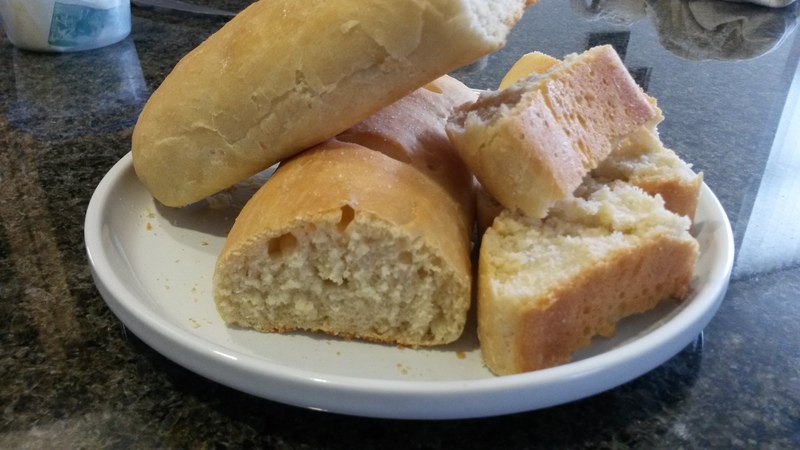 I had planned to spread preserves on my slices, but after trying it on one slice I found that the bright, fruity flavor of the preserves detracted from the subtle flavor of this beautiful, simple bread. It felt like a sin to put anything on it other than butter and salt. So I didn’t. This can’t have been that big of a mistake, then, if it tastes so good with the bare minimum that I’m not interested in eating it any other way. 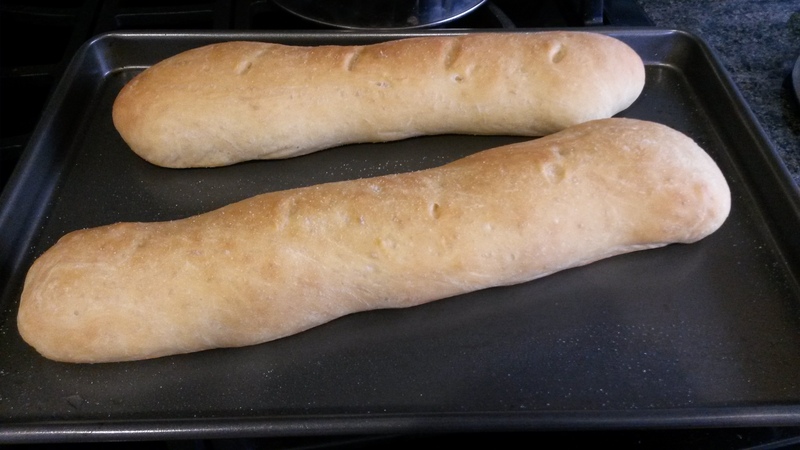 I’ve done the steam thing before–the only other time I made French bread, in fact–and I’m not sure I notice a difference in texture. This bread is soft, which is my personal preference, and I don’t remember the other bread I made being particularly crusty. So I’m calling this a win. It was nice to have Toni Morrison’s confirmation that leaving salt out of the bread is nothing more than a mistake. 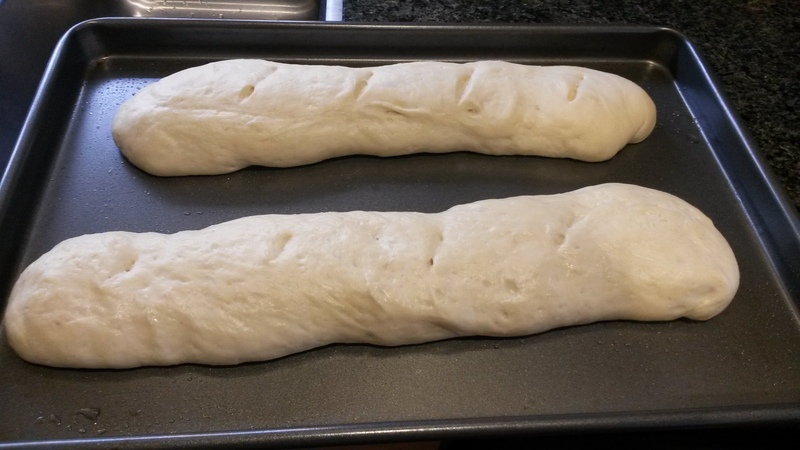 Tammy and I got together to make this bread this weekend because it would be our last time baking together before I moved to Virginia, and I’m taking the salt mistake (and the Beloved coincidence) as a good omen. I don’t have a very solid reason for moving, really. It’s not for a job (though I’m hoping to find one). In fact, it’s kind of to get away from things–my job at a place that has been likened to a sinking ship; my first and only relationship that came to an amicable but sad end; the Bay Area where prices are climbing and startups are king–and move toward something else. My best friend Kate and I have always wanted to live near each other, and now seemed like a good time to give it a try. I’ve been told that quitting my job without having another lined up is a bad idea, and I’m sure making a move across the country to a place where I’ve never lived could be seen as one, too, but I’m at a point where I’m willing to try. If this is a mistake, that’s okay. I’m quickly gaining expertise in that department. In a large bowl, combine 2 cups of the flour, the sugar, THE SALT, and the yeast. Add the warm water and oil and stir to combine. Stir in the remaining flour 1/4 cup at a time until the mixture becomes a dough. Knead the dough, adding flour as kneaded (sorry) until the dough is smooth and only slightly sticky. Grease a large bowl with vegetable oil and put the dough in the bowl, then flip the dough over to ensure that it is fully coated in the oil. Cover the bowl and let rise in a warm place for about 1 hour 30 minutes, or until the dough is doubled in size. If you’re not sure, poke the dough with your finger–it’s ready when the indentation remains. Grease a cookie sheet with oil or cooking spray and sprinkle the sheet with cornmeal (if using). 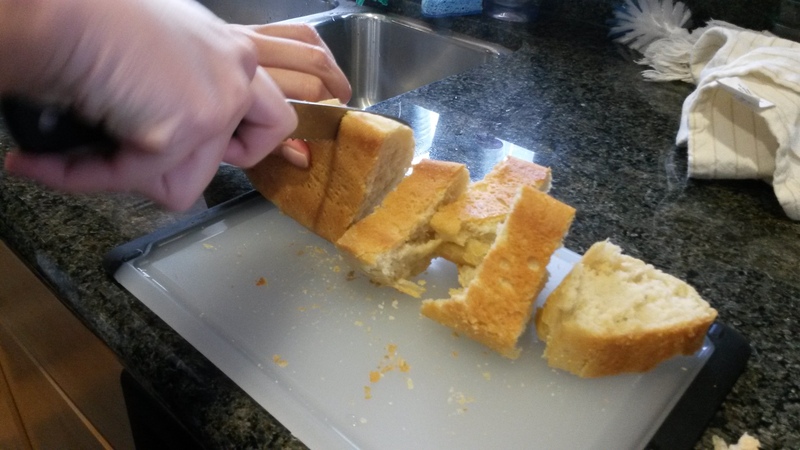 Use a sharp knife to cut 1/4″ deep slashes every two inches on the loaves. Brush the loaves with cold water and let the loaves rise (uncovered) in a warm place for an hour or until the dough has doubled in size (mine didn’t quite double, so just take what you can get). Note: If you’d like to be better than me and use the steam oven method for a crustier crust, put a pan on the floor of the oven while the oven is pre-heating. 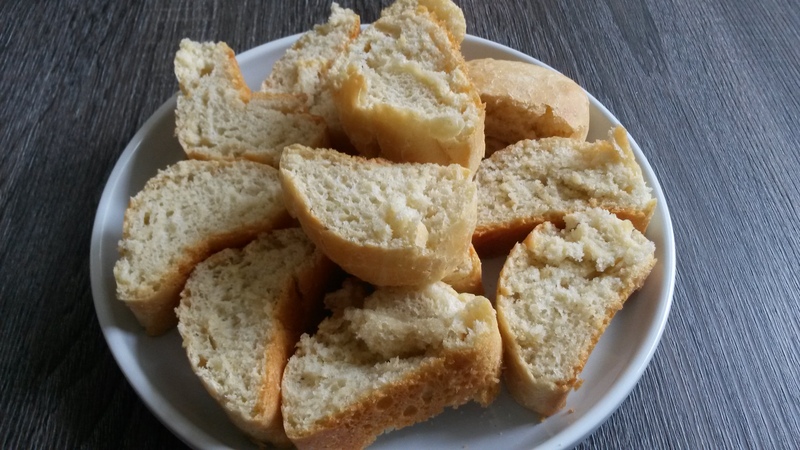 Immediately after you put the bread in the oven, pour a cup of hot water into the pan (be careful!) and close the door immediately. Bake the bread as instructed. Preheat the oven to 375 degrees Fahrenheit. If using an egg wash, beat together the egg white and a tablespoon of cold water; brush the mixture over the loaves. Bake the loaves for 25-30 minutes or until the loves are golden brown (if you can’t tell from the top, check the bottom of the loaves for a golden brown hue) and the loaves sound hollow when tapped. Let cool on a wire rack before devouring.